Emma is a postgraduate social research student at the University of Liverpool. 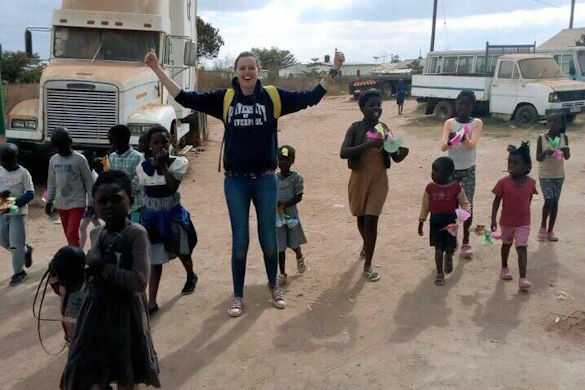 Having spent many years dealing with an eating disorder, Emma decided to take the huge step of volunteering in Ndola, Zambia, over the summer. We caught up with her after her arrival back in Liverpool to find out more about her mental and physical journey. Let’s start with your mental health journey over the last few years. Eating disorders are like deadlines. Life goes on, we do more of it, and we think nothing of it and then suddenly it’s ‘this real moment’. So, I’m not sure when it started. I have come to know it’s played out in anger, ‘bad behaviour’ and acting out of sorts, when what was actually on my mind was the food I was consuming, the body I was in and the interaction between the two. However, it was something I could never seem to express. For me, like many this has been difficult because of the disjuncture been the ‘everyday eating disorder’ and ‘the media eating disorder’. Here I mean, we hear about the 3st white, middle class girl who nearly died who’s now in hospital with a tube as the GP and parent didn’t notice. This does happen, but it’s in the minority. Whereas, the more common ‘everyday eating disorder’ is the ‘normal’ weight girl, running away from support services, disguising their weight and having a very secret battle with this food body relationship, all in a bid to hide it from those closest and even oneself. Something which I most appropriately consider my journey. When did you first realise you needed to reach out for help and what were your first steps? That’s actually a really funny question. I guess Emma could live in denial about being in denial. Honestly I would say I didn’t reach out for help. It begrudgingly found me / I got thrown into it, or maybe one could say it was disguised, and I was naïve. I was really lucky in my final year at Liverpool Hope that the mental health advisor came alongside me. She was a mental health nurse and I guess I really didn’t know what that meant or entailed. What I did know was that I was having very bad anxiety and panic attacks in the corridor at university owing to my preoccupation with food and weight, and it was affecting my studies and my peers’ studies substantially. When I moved to the University of Liverpool I wanted to do university without this stabiliser, but my disability advisor suggested I was referred to the mental health advisor in case of a problem. Spoiler alert! By the time the appointment had come I was knee deep in an out of control eating disorder. When I went back to the mental health advisor after Christmas I had printed my withdrawal form, but I realised it wasn’t the university I was wanting to end, it was having an eating disorder at university which university got in the way. Well she was now standing in the way, and before long a GP and eating disorders team. I resented it and hated it. And to an extent denied it. But they were humans. Humans who were consistent, gentle but firm, and were not willing to move out the way no matter how loudly I screamed. How easy did you find it to open up about your mental health? An absolute nightmare, and I still do. I can talk about it objectively. But I find it hard to talk about it on a personal level, and this has not been easy to write. Not because of what it is, but because of what it means. People put mental health in this perception that life stops, and the person disappears. I hope people see me as the same Emma after reading this, as they did before. As I’m still Emma. A postgraduate student at university, dreaming of pursuing a PhD and volunteering at the projects in Zambia, hopefully one day taking out people with mental health difficulties. People will see this, people may think I’m seeking attention, I’m deluded. My lecturers may think I am an unworthy student or incompetent for trying. Or maybe this post will make people think its ok for her as she’s got it all together, when they themselves are struggling. The honest answer is the battle carries on, and in many ways the battle hasn’t fully begun. I’m still in the grip of an eating disorder, taking a more than reluctant stance at attending appointments and therapy and seem to have a love hate relationship with the A&E department at the Royal, and cannot seem to avoid the radar of my GP. So what inspired your amazing trip to Africa over the summer? I’ve had a connection to Ndola, Zambia since July 2013, when I went as part of a church mission trip. Since then I have travelled out every year, and fundraised for the project. This has developed, and the opportunity came to head out solo to Dream Factory and Oasis in the summer. These projects work with the marginalised, stigmatised and vulnerable within the town. In particular this year I wanted to show that people with eating disorders are human and can do amazing things, and can be blessed to be a blessing. How did you feel when you arrived back in Liverpool? It was cold! No, it was a shock, it’s always hard adjusting to the cultural difference. Sitting in my new home reality hit. Either that was the last time I would step foot in Zambia and my dreams of going back and a PhD would go up in smoke by my eating disorder, or I would fight and there would be a future. Though, I would be lying if I said I have that view every morning. Do you have any life rules which you follow that you find help to improve your mental health, especially during difficult periods? Firstly, accept there will be bad days, some very bad days, and some I would rather forget they ever happened style days. For me I have a shower every morning. It stops me feeling morning gross, and it’s my chill out time, in difficult periods the showers are most definitely longer. Animals – I foster cats for a local rescue, which is highly therapeutic, makes me get out of bed as they need food. They need food so I need food. Or that’s the theory! As somebody who has accessed mental health services at the University, how did you find your experience? If I’m honest it took a long while for the systems to work. Nevertheless, I guess that can be summed up by someone with an eating disorder refuses treatment and to engage. But actually, I have gone to most of my appointments. Yes, I am typically a grumpy sod that day, but I’ve gone. It’s really handy and less intrusive and I think about it less as it’s on campus and feels the same necessity as going to a lecture. What advice would you give to someone who has a mental health condition, but is struggling to come to terms with it? I don’t blame you. It’s hard. It’s hard and consuming, and despite there being an end point, unlike a course of antibiotics it’s not time limited countdown. So, it can be demoralising. It’s tricky to explain the challenge but in many ways overcoming them or standing on the right path is contradictory to any other health condition. To ‘fix’ it you have to use your brain, which is the broken organ, to repair itself. I guess I draw a parallel to breaking a leg. When you break a leg, you are told to rest it and let it heal, and it will fix. The problem is you rest your brain with an eating disorder or any mental health condition you will be in hospital or dead before long. This is why my advice to anyone with a mental health condition is although it’s difficult, be open, honest and real with people. You need people around you, you need people to help you be your brain, without it’s impossible to overcome alone. In your opinion, what is the best way to help a friend or family member who is suffering with their mental health? Be there. Have patience. But be firm and consistent. Although it’s hard, draw a distinction between the person and the illness. What is the best advice you’ve ever been given in relation to your mental health? Go to your appointments, or the first step is making the appointment. The professionals around you are human: you may hate them, you may get frustrated with them, you may think some days they are the most irritating and annoying people on the planet but actually they just want to help, and they know best. One day you will look back and know deep in your heart they are a big part of the reason why you are here, well and with a degree. They are human they have good and bad days too. What do you think can be done to improve people’s understanding of mental health? The brain is an organ, which can malfunction, we just don’t really understand it all yet. So, I wish there was more education for students and society about how mental illness affects people beyond the given. Mental illnesses are not homogenous, and they show and affect people differently. It doesn’t mean they are less serious or affecting the person to a lesser extent. What’s the most common misconception about mental health in your opinion? Having a mental health illness means you have to put your life on hold till you recover. Many people were more than opinionated about me going to Zambia, and that was a justified position. I was going to a country where my body and brain was going to be put under strain, and it had been struggling in the UK. As much as there were challenges, for me my trip to Zambia was the get back on the bike and ride it moment. The bike is on fire and you are going through a fire. But people are going to help you ride it, and help you put the fire out. Seeing life outside the ‘normal’ helped me to see there is a better day out there, days when I can do amazing things. But crucially it taught me that doing university and life with an eating disorder is nothing little or normal but a victory in itself. There are lots of support services and resources available all year round for all students at the University if you need them at any time during your studies. The University Counselling Service is available to help any student address personal or emotional problems that get in the way of realising your full academic and personal potential. It offers free and confidential advice across drop-in sessions which are available between 11am-1pm every weekday in the Alsop building. The sessions are staffed by the Advice and Guidance team, our Counselling Service and our Mental Health Advisers. If you need some advice or support about welfare or wellbeing, please come along to a drop-in session. You don’t need to book. Simply turn up at the Alsop building and go to the Student Welfare Advice and Guidance reception. The University is continuing to invest in mental health and wellbeing support for students and is in the process of appointing three additional wellbeing advisers, two additional mental health advisers and an additional disability adviser to enhance our central services.